Acting pricey: Tyre makers say if the price of natural rubber continues to appreciate, companies may have to raise the use of synthetic rubber to 30%. Kochi: Rising prices of natural rubber, the basic raw material for making automobile tyres, is squeezing the margins of tyre manufacturers, forcing them to increasingly look at synthetic rubber as an alternative. Natural rubber is currently priced at Rs90.75 a kg, up Rs10.75 from Rs80 a kg in May-June. The hike in the price of natural rubber could shave off 3-5% profits of the tyre companies, said Onkar S. Kanwar, chairman of Apollo Tyres Ltd, a leading tyre maker in India. Kanwar said his company is exploring the possibility of doubling the use of synthetic rubber. Natural rubber accounts for about 50% of the production cost of a tyre maker. Other raw materials, such as rubber chemicals, chord, carbon, etc., are by-products of the petroleum industry and their prices are linked to oil prices, which are already ruling firm in the international markets. D. Ravindran, director general of Automated Tyre Manufacturers’ Association (ATMA), the apex body of tyre companies, said tyre manufacturers have started looking at synthetic rubber as a raw material. Last year, the average ratio of natural rubber to synthetic rubber was 79:21. This has now changed to 74:26, he said. If natural rubber continues to appreciate, companies may have to raise the use of synthetic rubber to 30%, some tyre makers said. “Ultimately, it is the decision of individual companies," Ravindran said. During April-June of current financial year, the price of synthetic rubber was on an average Rs6 lower than natural rubber per kg. Domestic demand for rubber in April-September was 416,800 tonnes, up 3.2% compared with the same period last year. ATMA and the trade promotion body Rubber Board are critical of the rubber futures trading on commodity exchanges but Kanwar of Apollo Tyres finds nothing wrong with futures trading, although he admits that there is an element of speculation. “The genuine players can take the advantage," he said, adding that his company was using the platform actively. The Rubber Board has asked commodity futures regulator Forward Markets Commission to restrict the daily volatility in the trade. The board attributes the high volatility in rubber futures trade to speculators. According to the board, rubber prices ruled much above the international prices between September 2006 and February when the domestic production peaked. Normally, after the monsoon, rubber tapping is in full swing, which pushes the production up and brings down the prices. But the board said prices were manipulated during this period, which adversely affected natural rubber exports. 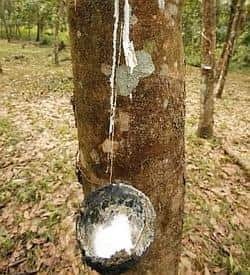 According to the latest statistics from the board, natural rubber exports in April-September were down to 16,215 tonnes against 47,729 tonnes in the year-ago period. But Kailash Gupta, managing director of Ahmedabad-based National Multi-Commodity Exchange (NMCE) said ever since the exchange introduced rubber futures in May 2003, the fair and transparent electronic trading platform has benefited nearly 9,000 clients, including a large number of small and marginal plantation growers. The exchange has been an active player in rubber futures. The dominant player is the Mumbai-based Multi-Commodity Exchange. Defending rubber futures trading on NMCE, Gupta said the exchange has provided an alternative trading platform to more than a million families of small plantation growers, who were earlier forced to make distress sale whenever the organized consumers withdrew from the market. According to him, the domestic price (Rs90.75 a kg) is in sync with the international prices (Rs88.41 at Bangkok). “It is also for the first time that the Indian rubber futures have proved to be a price-setter, rather than price-taker," he said. According to him, the domestic market price used to be based on international prices but with the commencement of the futures trade, the global market has been taking cues from the Indian futures prices. “The benefit of futures trading far outweighs the earlier administered pricing regime. This is reflected in the rising volume of rubber trade on exchanges, " Gupta said. The physical delivery of rubber reached 49,520 tonnes at NMCE until the expiry of the September contract last fortnight.